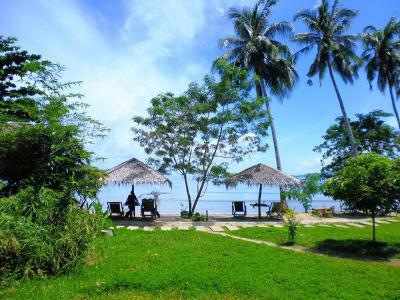 Lock in a great price for Tapik Beach Park Guest House – rated 8.2 by recent guests! Beautiful location. 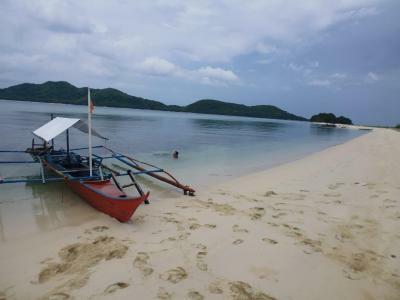 Very peaceful area, compared to other places we visited on Palawan island. The staff were fantastic, very friendly and helpful. The bar has lots of great food available, for good prices. The boat trip the hostel arranged for us was fantastic, definitely recommended. We stayed in a tent facing the beach, which I was a little worried about, but prior to our visit the hostel staff contacted us and gave us lots of information. They were very upfront and honest, which impressed me. The facilities and style of the guest house was one of the best I have seen. It was incredibly comfortable, probably one of the best. Location was incredible and the staff were amazing and friendly, they even gave me a welcome drink when I arrived late at night! It's the most relaxing place I have visited with the least amount of tourists, perfect to relax and take it slow. There is no wifi or 3G/4G signal, which is still great, but you can go to the village of Sibaltan next door, and if you have a GLOBE sim card, it works great there. Amazing location for a resort done with care for detail and good taste. 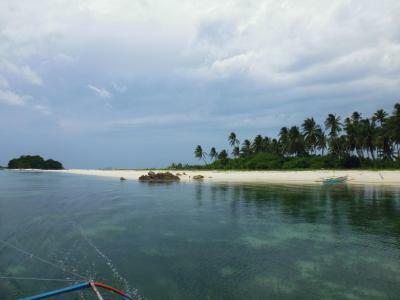 They contacted us in advance to help us arrange our arrival to Sibaltan. Very passionate and caring owner (and designer of the place) The restaurant had a broad variety of food which was delicious. Breakfast was also amazing. They have a lot of options for all budgets. Sunrise was the most beautiful nature show! They have massages overlooking the water. A dream come true. Even the shared toilets are spacious and designed to the detail ina natural and local way. The island adventure. The staff. Excellent fried rice. I like the staff, they're friendly and so helpful. They also have initiative, Kudos to Dean and Charmaine Great Job you two! This place is remote, if you are looking for a place to chill and just enjoy nature, this is the spot for you. 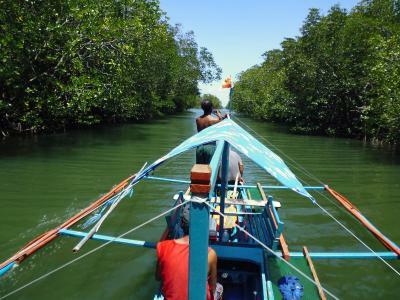 They also have tours and water sports, so you'll definitely enjoy your stay! The place itself is really awesome, the crew also nice. Secluded place and relaxing. The staff is amazing! Service minded, friendly, helpful and goes the extra mile to ensure hotel guests are happy with their stay. The service is truly perfect. They served perfect breakfast much more variety than we expected as we needed halal options. We really enjoyed the massage. We were also lucky to have a very romantic and tasty dinner at the beach, decorated by Blad and Jerome and delicious food prepared by talented chef. We were so delighted and feeling touched by their good service and friendly nature. Thank you so much Tapik Team. We will see you again next month! 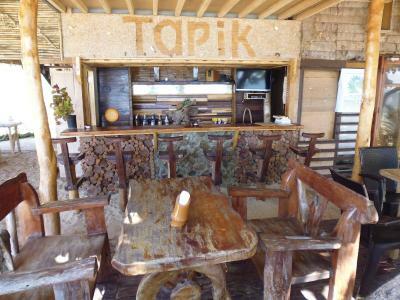 I would highly recommend Tapik, dont listen to other peoples whining its a great hotel with genuine, kind and loving people. This must be the most lovely hotel in Sibaltan. This is our third visit there. The staff are so caring and out to give you a wonderful stay. The bar and restaurant were extremely great. The best was the rooms and restrooms are clean and we had a really good breakfast. We did the Linapacan tour and it was one of the best activities in Tapik. Highly recommended. Tapik Beach Park Guest House This rating is a reflection of how the property compares to the industry standard when it comes to price, facilities and services available. It's based on a self-evaluation by the property. Use this rating to help choose your stay! 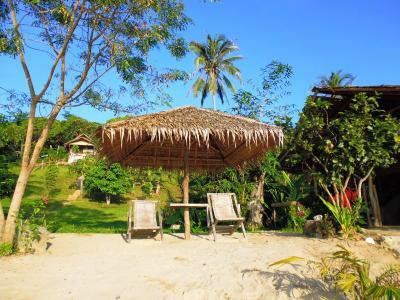 Offering a private beach area, Tapik Beach Park Guest House is located in El Nido, a 5-minute drive from Cuyonon Heritage Museum and a 5-minute boat ride to Bubog Island. Free parking is available on site. The area is popular for fishing, kayaking, and kiteboarding. 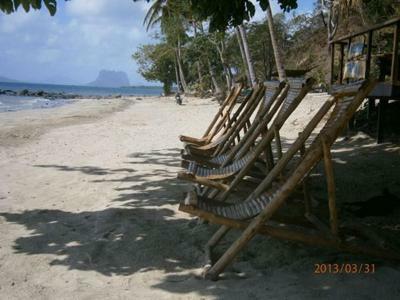 Guests can arrange day trips to nearby islands of Linapacan and El Nido area at the tour desk. 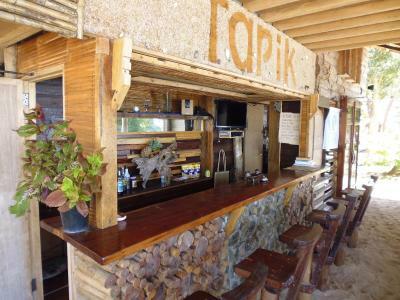 At Tapik Beach Park Guest House you will find a small bar and restaurant serving local cuisine. 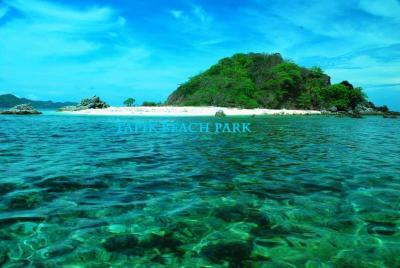 When would you like to stay at Tapik Beach Park Guest House? 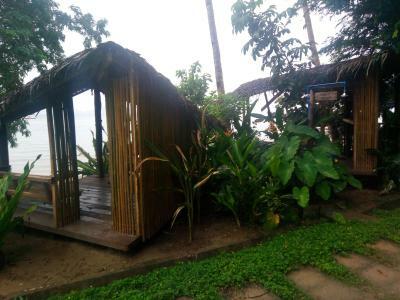 Traditional Filipino Nipa Hut features a private terrace. Guests have access to a shared bathroom. Cottage features a private terrace and private bathroom with shower. 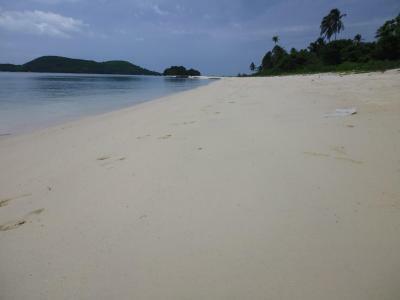 Guests will be camping in a private and pristine island in Eastern El Nido. 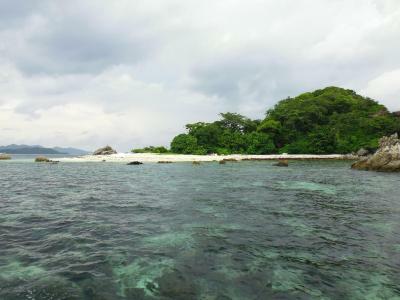 Guests can engage in activities such as snorkeling, kayaking, learning basic survival skills, and even stargazing at night. 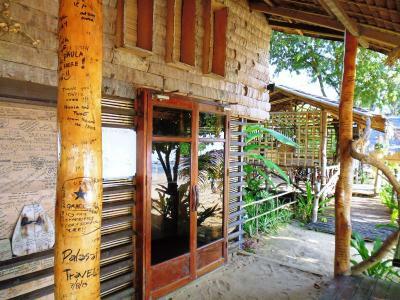 Constructed from native materials such as bamboo, coconut and local wood, this twin/double room overlooks the ocean. It comes with a fan, clothes rack and private bathroom with shower. This is a camping tent pitched under an open hut by the beach. It features a mattress, pillows and a hammock. 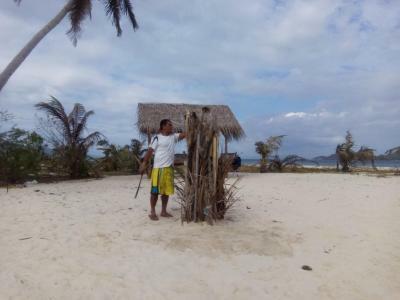 House Rules Tapik Beach Park Guest House takes special requests – add in the next step! All older children or adults are charged PHP 500 per person per night for extra beds. Electricity runs from 06:00 to 18:00. There is no ATM in the area but PayPal can be an alternative if you run out of cash. 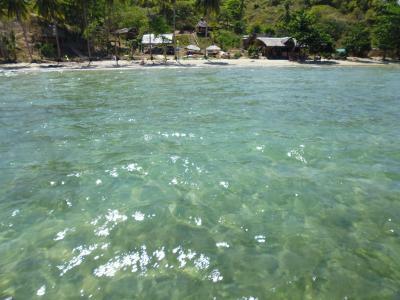 This place is about 1 hour from El Nido and transport is limited. Please contact the hotel for instructions. 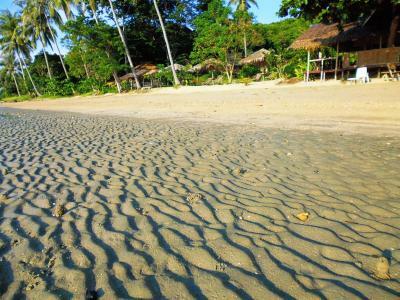 Please inform Tapik Beach Park Guest House of your expected arrival time in advance. You can use the Special Requests box when booking, or contact the property directly using the contact details in your confirmation. Unfortunately some guests were very loud the whole night and the lights in front of our tent didn't turn off, so we couldn't really enjoy the peaceful Ambiente. Also the food on side is quite expensive and the amount is very small. You should have an own scooter and go to the next town for food and water. 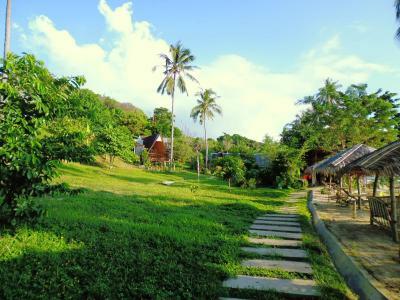 Stunning location, really nice hosts, comfortable tents and really clean bathrooms! Absolutely recommended!! 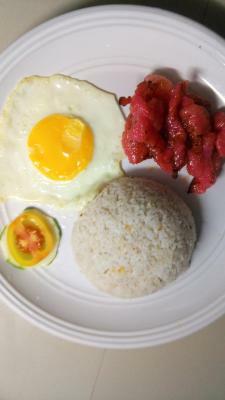 The breakfast variety can be improved, although they’re also good. 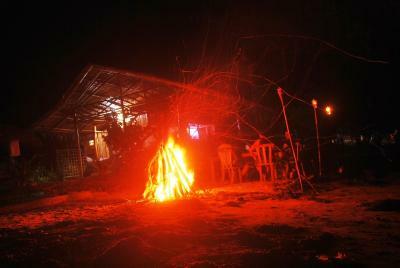 The ambiance and the paradise-feel being away from the crowd of Coron. And the Sunrises were all breathtaking! And the dogs were supper friendly.. The zip on our tent was broken but it was easily fixable. There were a bit of rubbish along the beach but they do clean it up in the morning. The beach is amazing and as well as the whole vibe of the place is very chill and relaxed! Lots of ants in the upper floor of our beach hut on the morning. Wifi pretty much nonexistent. Also the food was good but could be bigger quantities and maybe some more choices in the menu. Everything ! We were greated upon arrival. Our Beach Hut was amazing with a beautiful sea view. We had 3 floors in our Beach Hut so a lot of space and a sitting area to enjoy the view (much better than the pictures on website). 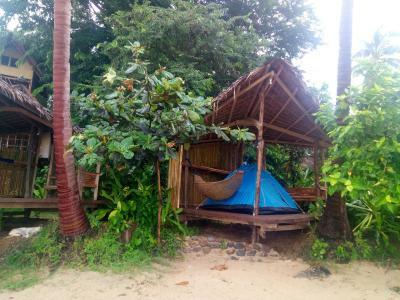 So far the best accommodation we had in the Philippines ! 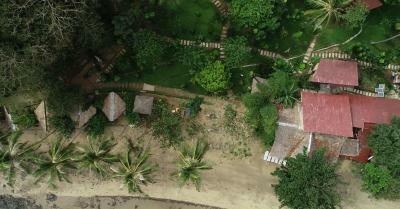 Lots of hammock and long chairs on the beach and good food at the restaurant. The propriety is right on the beach. It's the perfect relaxing place ! 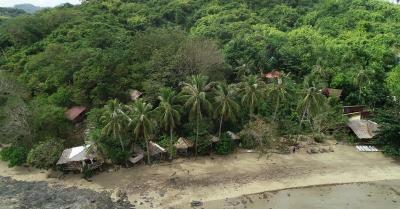 Also for lower price, the Camping Huts were looking very nice and were located right on the beach ! 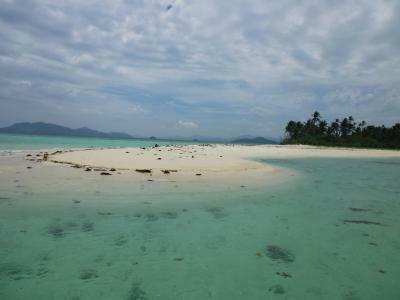 Paradise in Palawan. Loved it here! 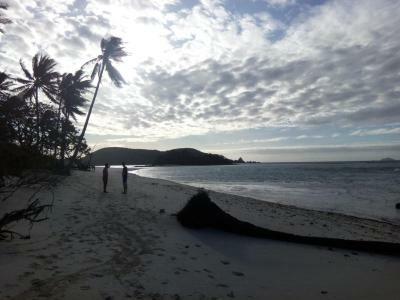 Beautiful beach, amazing hoping tour and best staff Ding and Cristian made it unforgettable stay. If you are looking for relaxing place to forget rest of the world is perfect for you. Hope to be back soon! 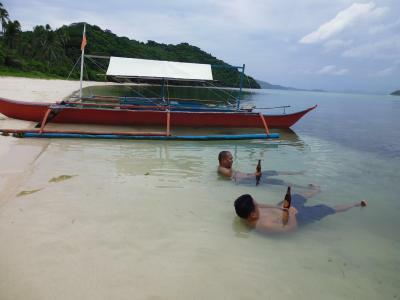 We (two guys)rode a scooter from El Nido to Sibaltan (about an hour), eventually tired and thirsty and had a pit stop at the hotel bar. We had a little chat with guests and decided to stay at the hotel. When we asked the receptionist guy if there was room for two, he said "no we are fully booked" without even looking at us. I checked the booking.com and there was eight vacant rooms. When I showed the booking.com, he mumbled something (didn't understand exactly what he meant) and eventually I booked online. We felt somehow we weren't wanted there which was weird(Bad experience). The hotel might be single girls or couples. The place is perfect for couples on honeymoon or people who want to stay away from humans. You can see the sunrise from your bungalow or tent and hear the waves when you wake up. Super silent and chilled. Far from the crowded area, excellent staff, amazing place, really good food, friendly people, dog friendly. Food choices where quite limited. Often certain foods or drink weren’t available. Simple houses but very nice view. Direct at a beach that is.not crowded. And lots to do during the day! If you are in to water sports. Common bathrooms were rather primitive. Very nice and helpful staff, super location. Amazing view to the sea. Perfect place to unwind. Super friendly staff. Sleeping with the sound of the waves. Good choice of food. Excellent value for money.